Will Fantasy Owners Like Ike? Ike Davis made his Major League debut on Monday night and he’s already a fan favorite. The new Mets first baseman has the luxurious job of replacing Mike Jacobs, who represented the lowest common denominator amongst big league first basemen before the Mets sent him packing. The Mets could put Charlie Brown there and the fans would respond by cheering the comic strip covering first base until the wind inevitably swept him deep into the Gotham night. Davis has the lineage to be a successful baseball player. The 23-year-old – born Isaac – is the son of former big league pitcher Ron Davis. After a stellar career at Arizona State, the Mets nabbed Davis with the 18th selection in the 2008 draft – a few slots after teammate Brett Wallace was selected by the St. Louis Cardinals. Davis has since flown through the Mets’ minor league system, with an abrupt stop in Triple-A for all of 10 games. His 2009 Double-A statistics through 233 plate appearances were pretty solid: .309/.386/.565, but Davis’ overall minor league statistics were .288/.371/.467. The obvious question is now whether Davis holds fantasy value in non-keeper leagues. Well, he’s the best fantasy option the Mets have at first base, which should give those in National League-only leagues reason to add him. For the rest, it’s worth waiting and seeing. Along with the New York prospect hype, Davis hit two home runs in that short Triple-A stint. Do not buy into a sudden power surge though, since he previously hit 20 homers, with seven of those coming below Double-A. Remember, he was a college pick and a college first baseman at that. The expectation levels are higher than normal. Baseball America ranked Davis as the Mets’ fourth-best prospect. Noting that his swing has the tendency to become pull-happy and that his swing was rather long, leaving him likely to strike out quite a bit. That’s not to say Davis won’t eventually become a decent major leaguer. He might even be decent out of the gate. But the hype can mostly be explained by post-Jacobs depression alleviation. If the Mets fan in your local league is buying into it, then by all means, allow him to claim Davis first. He’s just not a great fantasy option right now for standard 10- and 12-team mixed leagues. 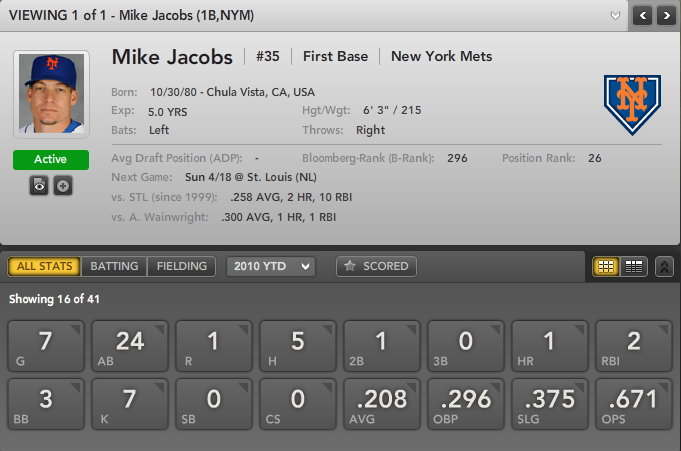 For more on upcoming young players like Ike Davis, check out Bloomberg Sports Fantasy Tools.